Celebrating its tenth year as part of the nationwide festival, Metro Detroit’s 2017 edition of the Italian Film Festival USA brings the best modern-day Italian cinema offerings to Detroit area audiences, April 5 – 30, with films from award-winning directors as well as debut films from exciting new talent. There will be 13 screenings in all, with 11 films making local premieres and a NEW short film program featuring seven titles from which the audience will get to choose a favorite, and special guest appearances. Now in its 13th year nationwide, the Italian Film Festival USA offers 95 screenings of recent Italian films -- captivating dramas, hilarious comedies, and interesting documentaries -- to audiences across the country. In addition to Detroit, festival cities are Boulder, Chicago, Cleveland, Indianapolis, Kansas City, Memphis, Milwaukee, Phoenix, Pittsburgh, Portland and St. Louis. Last year’s event in Metro Detroit drew more than 3,500 people and was the most highly attended of all participating cities and in its own history. 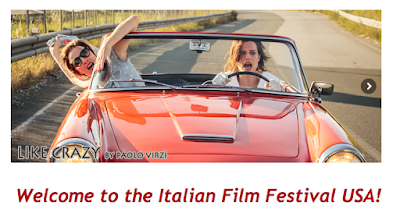 The multi-award winning film, “Like Crazy” opens the Italian Film Festival USA of Metro Detroit on Wednesday, April 5 at 7 p.m. at the Detroit Institute of Arts’ Detroit Film Theatre. Weekend screenings will then continue throughout the month at various locations, including Wayne State University (Detroit), University of Michigan (Ann Arbor), Henry Ford College (Dearborn) and Chippewa Valley High School (Clinton Township). “The Stuff of Dreams” will close the festival on Sunday, April 30 at 4:30 p.m. at the Detroit Film Theatre and features a special appearance by director Gianfranco Cabbidu. Additionally, a discussion will follow the screening of “Andrea Doria: Are the Passengers Saved?” on Friday, April 14, with Detroit scriptwriter and survivor Pierette Domenica Simpson. A full schedule is below. All films will be shown in original language with English subtitles. The 2017 Italian Film Festival USA of Metro Detroit is supported by the Michigan Council for Arts and Cultural Affairs Minigrant program, administered by the Anton Art Center. 2016 - Director, Paolo Virzi, Comedy, 118 min. Beatrice and Donatella are patients of a women’s mental institution. Their friendship brings them to a hilarious escape and the search for a little happiness in the world of the sane. A modern day Thelma and Louise! 2015 – Director, Massimo Gaudioso, Comedy, 92 min. The residents of a mountain village are desperate to save their small town. Will their wacky plan succeed? 2016 – Director, Massimo Ferrari,, Documentary, 75 min. The stories of Italians who have opened their homes to immigrants from all over the world with positive results. 2016 – Director, Luca Guardabascio, Docu-drama, 77 min. On July 25, 1956, the Italian passenger liner Andrea Doria was broadsided by the ship Stockholm. Pierette, then a 9 year-old immigrant, now recounts the harrowing experience and the truth surrounding the tragedy. 2014 – Director, Alessia Scarso, Drama, 100 min. Based upon the heart-warming true story of Italo, a stray dog that wandered into a small Sicilian town. 2016 – Director, Matteo Rovere, Drama, 2016, 110 min. The passion for racecars has always flowed in the veins of Giulia De Martino. She comes from a family that churned out racecar champions, but now it is up to her to save the family. Can she bring home the victory? Friday, April 21 – Screening will take place in Rackham Auditorium. 2015 - Director, Massimiliano Bruno, Drama, 103 min. Luciana is leading the quiet life she’s always desired with her husband, Stefano. But shortly after finding out she’s pregnant, Luciana gets fired and her world starts falling apart. Will she find justice? 2016 – Comedy, Drama, Stop Motion, 90 min. 2016 - Director, Roan Johnson, Comedy, 98 min. Ferro and Cate have just nine months to prepare themselves, as well as their parents, for the arrival of a baby! Will they be ready? 2016 - Director, Roberto Andò, Drama, 100 min. The director of the International Monetary Fund invites an Italian monk to hear his confession at a G8 meeting. Following a tragic and unexpected incident, the G8 ministers and the monk engage in an intensifying struggle. 2016, Director Marco Segato, Drama, 92 min. A teenage boy and his father have a strained relationship. When a bear threatens their small Dolomite village, the father accepts a bet to search for the bear. Will he succeed in saving the village and his son? 2015, Director Gabriele Mainetti, Drama, 112 min. Enzo comes into contact with a radioactive substance and discovers he has superpowers. Then he meets Alessia who is convinced Enzo is the hero from the famous Japanese comic strip Steel Jeeg Robot. 2015 - Director, Gianfranco Cabbidu, Drama, 101 min. A boat carrying a small acting company, together with a group of mobsters, wrecks on the shores of an island prison after WWII. An homage to Shakespeare’s The Tempest and De Filippo’s Art of Comedy. *Special appearance by director Cabiddu. For more information about the Italian Film Festival USA of Metro Detroit, including sponsorship opportunities, please visit the festival's website www.italianfilmfests.orgor call 248-917-2352.